PRINCETON, FL September 4, 2013 – TWN Industries Inc., the leading water transfer printing supplier, announces the release of “Flage”, a new camouflage film pattern that’s reminiscent of the iconic World War II camo pattern. And while Flage pays homage to its camo predecessor, it does so with a bit of flare. The first color scheme to be released is a purple and gold color combination that’s as bold as the person who uses it to express himself. Flage is a far cry from the generic camo patterns currently out in the market. This pattern is for the person who wants to stand out, not blend into their background. And since this pattern’s colors are fully- customizable with a minimum order quantity (M.O.Q.) of 250 meters or more, it makes this an extremely versatile pattern to work with. Processors can dip a number of parts with this pattern, ranging from cell phone covers to ATV’s. No matter what niche your business is in, Flage will widen your target demographic. “Open up any fashion magazine today, and you’ll find everyone from celebrities to models sporting the camo look. Flage is the perfect pattern to capitalize on this trend. Additionally, its versatility is important because the color scheme can be adapted to your regional market,” stated Mike Richards, Director of Business Development at TWN Industries. 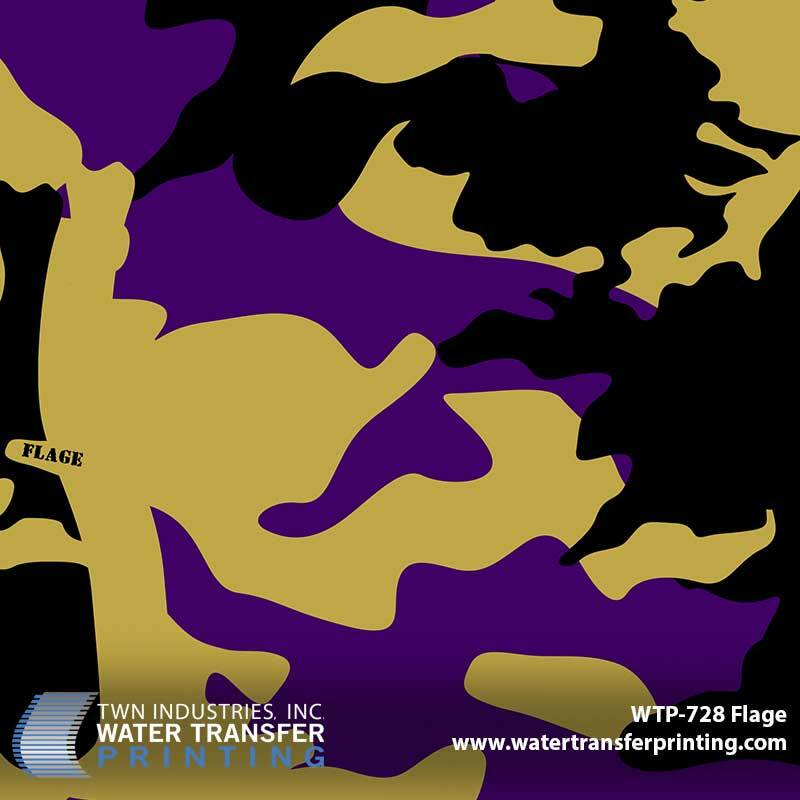 The Flage water transfer printing film patterns are available exclusively through TWN Industries, Inc. Three-meter accessory packs and production quantity film are available immediately. The part number is as follows: Flage WTP-728. To find a TWN Certified Decorator who can decorate products for you, or to purchase film, call 305-258-9622.